I have never read another story quite like this one. The book itself looks very long, but it isn't. It is precisely as long as it needs to be. The chapters of this book are rather short, the longest being maybe four or five pages. And, as short as the chapters are, the writing is not your usual pages filled with words top to bottom type of writing. Beth Bracken and Kay Fraser have sparse sentences and dialogue intermixed with the most amazing artwork by Odessa Sawyer. With all that said, it is one of the most well-written books I've read to date. I know that saying the authors have done something that is practically perfect seems both unrealistic, and also holds the authors to a pretty high standard, but I'm unsure how else to describe it. When flipping through the book before starting it, seeing how sparse the written word was, I was skeptical that it would be a full, well-rounded story. However, I was glad that I was wrong. They've written precisely what they've needed to in order to grab the reader, hold their attention, and develop the world without adding any unnecessary (or even semi-necessary) fluff. It was a seriously refreshing change of pace for me. As I've already mentioned, the artwork throughout the entire book is simply mesmerizing, and even now that I've finished it, I find myself going back through and studying the subtle details. Pay attention to it on your first read-through, however. It is an integral part of the story. It helps convey the emotion, the contrast between dark and light, and the true fantasy of the faerie world. The entire story you flip (chapter-to-chapter for the most part) between two best friends', Soli and Lucy's, points of view. Soli, the quiet, shy one who prefers to stay in the shadows while Lucy, the bright, vibrant, social butterfly soars and excels in what she does. As the story progresses, you'll be pleasantly surprised as Soli comes to know her personal strength and Lucy gets to see her friend blossom. Even that back and forth style of writing was a refreshing change from most of my more recent reads. There is love in this story, and it the main reason the ball starts rolling down the slippery slope into the Faerieground, but it is not necessarily a romantic "love story." It's more a story of self-discovery with some romantic undertones. The true love in this story is the love of two best friends, who are more like sisters and two halves of a whole. 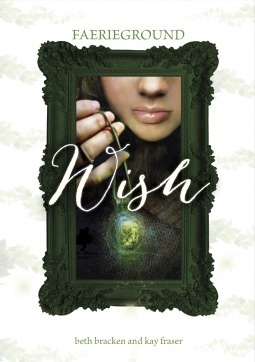 While this is aimed at middle grade readers, I think just about anyone who loves and believes in faeries will adore this story. Also, there is a sneak peek of the next book in the Faerieground series at the end and it promises to be just as wonderful and refreshing as the first!